Imagine waking up in a Victorian bed, mist around you, the sunlight flitting in and hills as far as the eyes can see. Got the picture? Great, now go book yourself into Primrose Villas. 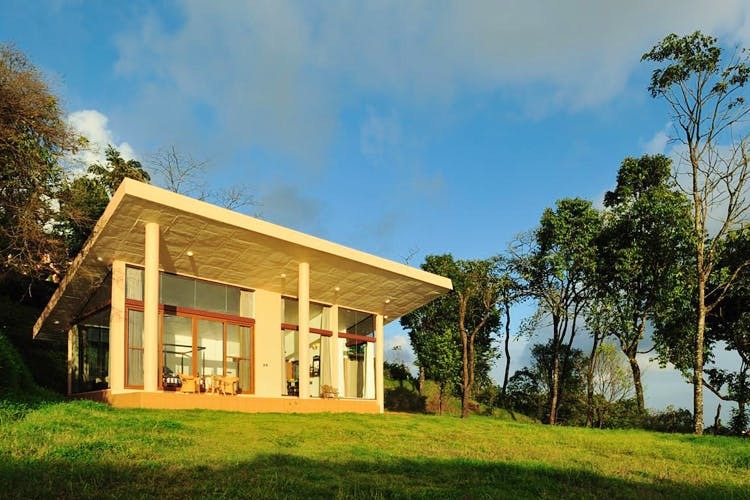 While this ‘living in glass house’ concept, on a normal day, would be a not very favourable thought, in the hills of the glorious Chikmagalur, it certainly is! Offering swanky all-round glass cottages, Primrose Villas is something quite out the ordinary, especially in India. How often do you get to feel so close to nature, right? Each of the villas, spread across a luxurious 1,000 square feet, have a private space around each of them, so there’s no worry of your nosy neighbour peering at you while you nap. Inside, in keeping with the luxe theme, you will find antique furniture, and new-age stuff modelled to look like they’re Victorian or Jacobean. Think cosy love seats, elegant chaise longues, regal armchairs, and of course, the all-important coffee tables — you are after all in coffee county. If you’re with your crew, bring along board games. Nothing like a solid game of Monopoly with the fire crackling beside you. And don’t get us started on the bathrooms. As ritzy as the rooms, these too are all glass. So, sneak in a lovely bubble bath with the blinds up, or if you’re conscious, then we suggest pulling them down just enough to shield you but not your view. It’s a bit of a cheeky thrill and we absolutely love it! To match the high standards of the living quarters, dining too is quite the elaborate affair here. With a 360-degree view and a practically 360-degree menu on offer, pick from your room, under the trees, on the terrace or the lounge to eat your meal. Chinese, European, Indian (the South Indian is amazing here) is on offer so don’t be afraid of running out of things to eat. Fancy a barbecue? No problemo. You pick the time and place. Getting here can sometimes be a problem, as cell reception is dicey. But map your route out on a proper paper and you're sorted. We strongly recommend you book well in advance. And sure the prices are a bit steep. But splurge at least once in your life on this rather exotic experience. Who knows, you might just get used the high life!